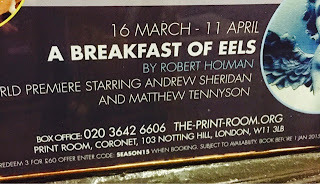 Our mate and playwright David Eldridge recommended that Stuart and I go and see Robert Holman's A Breakfast Of Eels at The Print Room in Notting Hill Gate. So glad he did. 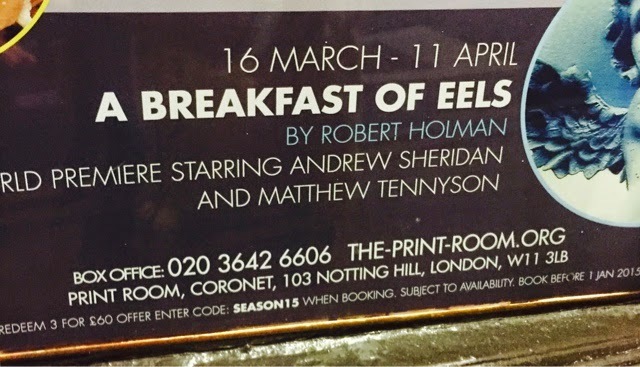 "You have to go and see 'A Breakfast Of Eels'. It is a shattering and beautiful play. Scintillating, ardent, rattles the bones and tears at your heart. It's like a cantata in play form but there is little stately. It is urgent, of London and of what it is to be a modern man with exquisitely turned heart and guts acting. Matthew Tennyson and Andy Sheridan give performances of such truth and commitment in a lovely production." I couldn't have put it better myself. Wonderful show. Stuart and I loved it. Thanks for the recommendation Dave!